This has been an ongoing issue, and I just realized I have the answer in my hand. JakeJP's Mms.apk has already been merged with 2.2 Froyo based CM-6. This has built-in user agent spoofing allowing people to use MMS with softbank. Of course I cannot confirm that it works, or give more detailed information on setting it up because I don't use softbank. If you are running CM-5, replace your current Mms.apk with JakeJP's Eclair version (latest version: Mms.apk.jakeMod11) or upgrade to CM-6, which is currently at release candidate 2 (RC2), which for me was extremely stable. So are the nightly builds, which already include Piaf's extremely cool, tweaked powerstrip widget. Directions for installing CyanogenMod are at the wiki. Jake has info for eclair and froyo on his personal site (in Japanese). I look forward to trying CyanogenMod6 but the market place and other issues are still keeping me away. Hope an update becomes available soon. CM's latest latest gapps (FRF91-MDPI-3) fixed the market for me. Automatic updating works and no FCs. I'd suggest backing up your current system, wiping and flashing the latest nightly, then the above gapps and giving it a shot. I've been very impressed with the progress on CM-6. I am sure you've checked and checked, and then checked again, but could the mms proxy or something like that in the APN you set be somehow... wrong? I doubt it since it worked for you - somewhat at least - with the original Mms.apk. Is there by chance an Mms.odex file in /system/app in addition to Mms.apk? I understand if so, the odex file needs to rm'd. It was a hard decision for me to give up my Japanese keitai email address. But now I am glad I did. Getting everything into my Gmail address makes things so much easier. And with the Gmail filters you can direct the noise out of the Inbox to Labels so your phone doesn't notify you of unimportant email. Roberto, any thoughts about what issues ext23 is having? @docomo.ne.jp address is not possible with the phone, but if I were to apply for the imode.net service I can download an app from the marketplace essentially letting me keep my current keitai address for messaging? when I install cyanogenmod I'll need a goldcard to downgrade and root my phone? I should install the latest nightly build or go with the stable version 5 (2.1)? Admittedly, I wish you had a tutorial, because it'd be Japan specific :D But I think I understand the cyanogen wiki for installation. Do you have another pointers or advice? I'm excited to see what Android is like. Need to clarify somethings first. Did you buy a Magic or did you buy the docomo-branded ht-03a. There are several versions of the Magic around, and the rooting procedure not only varies between versions, but also between carriers because different carriers' phones have different SPLs. The ht-03a has a 32B board with a perfect SPL, meaning it needs a goldcard. If you got one from Canada, Europe or the US, it may or may not be a 32B, could be a 32A, may have a perfect SPL, or could be the version with a separate audio mini jack - all of which require different rooting methods. If it is not a ht-03a, you won't be able to use it with Docomo. If it is an ht-03a, AFAIK, they won't even sign you up for the @docomo.ne.jp address, but perhaps this has changed. If they won't give you the address, the ImoNi app from the market place and i-mode.net sign up will not help. Go with the latest nightly of CM 6. I'd put up a more specific tutorial than the one I have for the ht-03a, but as android phones become more and more common, it would become a real pain to keep up japan-specific rooting guides. Basically, the ht-03a follows the same procedures for generic Magics with a 32B board and a perfect SPL, so the one I have will work (but requires you to check out other guides - sorry for that). Whatever you do, be sure you know exactly the procedure before starting. It's a new Docomo ht-03a. I bought it off rakuten auctions. Would it make a difference if I already have @docomo.ne.jp address? I guess I'll be needing to see a shop. Do you have a link to your tutorial? Not sure. 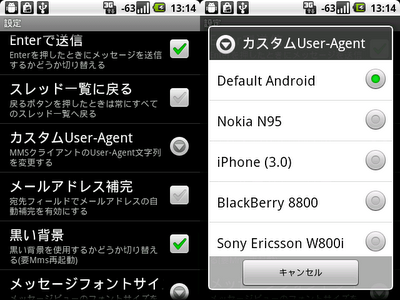 I'm using the "mailwebservice" APN and the user-agent from my old keitai (a 702NKII). Works perfectly. OK, then you are good to use it on Docomo. If you already have a docomo address, I think you should be OK, but I am not sure. If you kept the phone that docomo address is registered to, then you could certainly use it with a subscription to imode.net and imoni. What I am unsure about is that if you switch your plan to the ht-03a, is if they will let you keep that email, since the ht-03a is technically not compatible. I switched from AU to Docomo when I got my ht-03a, so I didn't have an address to start with. There is no good reason for them not to let you keep the address, even if you cancel service on your existing phone. But then again, J-carriers love to do things for no good reason. If that turns out to be the case, tell them you want to use it with imode.net, which is compatible with the ht-03a. It even says so on the imode.net webpage. If they still give you problems with it, I'd show them the webpage. Hopefully, none of that will be an issue. Also don't just take what one shop lady says, push it up the food chain. This is what I wrote up. It is focused on using linux or mac, but mainly relies on the guides that are linked (Amon_RA's an the Unlockr's). Amon_RA's guide is barebones and designed for people that already are familiar with linux and flashing files to phones. The Unlockr's is more for a general audience but is a bit long and convoluted. The Unlockr's guide may also have a disclaimer saying this method is obsolete - don't worry if you see that, because it is obsolete for some of the phones sold in North America BUT NOT obsolete for the ht-03a with the perfect SPL. It is the only way to root that phone. If you don't understand something, ask before starting ;-). here is CM's guide, which also points to Amon_RA's for the goldcard method. This is Amon_RA's guide; I guess I didn't have a link to it on my goldcard with mac page. When I rooted, I used this one but referenced the more noob-friendly Unlockr guide in my write up. I just got my phone in the mail today. It came with version 1.5, this may sound dumb, but what do I do? I was totally expecting to downgrade, root, goldcard and everything..
That's great, first don't do anything and don't accept the OTA to 1.6 or it will get much more difficult. First read up on rooting. I am pretty sure this will give you root without having to wipe the phone. Then, you can flash a recovery and backup the current ROM. I really want to get a dump of a clean Docomo ROM, so please don't wipe it. email me and I'll help you out. If we can dump the ROM from this phone, we can use it to put a docomo ht-03a back to stock and unroot if it ever needs warranty. Even though I still have a problem, don't know if it's normal or not. I can send MMS and receive them only if the size is lower than 250kb..is it normal? when they are bigger I get the download button and when I click then it says it's impossible to download even though I have internet connection and I can receive lower size mms and send them. About sending them, I can send them successfully but if I send a big size picture (more than 200/250kb) then then sender will get it as a small picture so it means it's resized...is that also normal? I cannot believe how well this works. That horrible softbank.app is out my life forever!